“Not all oil tanks are created equal,” says Lowbrow Customs’ founder Tyler Malinky, and in an effort to reset the bar in terms of customer expectations he and his team have applied their craftsmanship and internationally respected attention to detail and authenticity to make the best possible custom oil tanks they can. 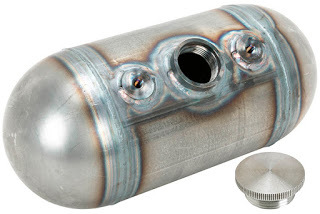 Available for Harley-Davidson Sportsters or Big Twins, plus Triumph or any other make of motorcycle Malinky says: “All of the components that make up these tanks, including the steel, are USA-made. 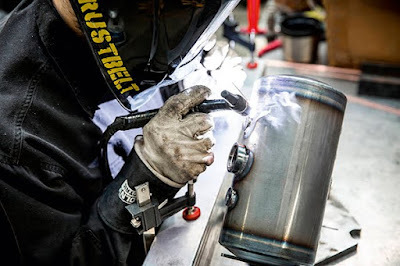 Every single piece of our oil tanks are custom - from the smallest detail on up. “We didn’t use any off-the-shelf parts; every piece was designed specifically for its purpose. These designs are a complete reboot for the manufacturing integrity of the humble but incredibly important custom oil tank - even the oil tank end caps are spun steel with tooling made specifically for Lowbrow tanks. Lowbrow oil tanks feature three mounting points (two top and one bottom) to ensure secure and stable mounting with steel mounting tabs. “This is only important if you actually ride your motorcycle! We do, and these tanks are road-tested and ready for anything you can throw at them,” says Malinky.